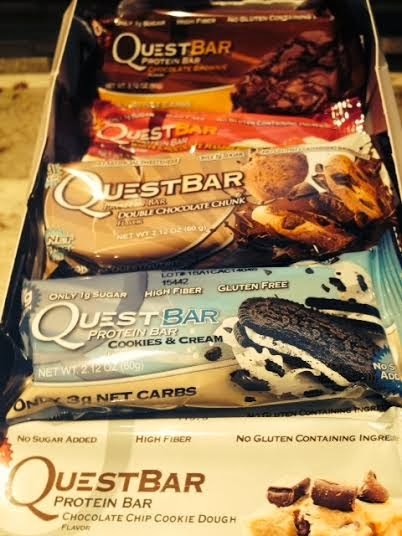 Simply Stacy: My protein bar "quest"
Everyone asks me what protein bars I eat. So let's talk Protein Bars on this #WellnessWednesday. "Eww. Protein bars are gross" "Yuck this thing tastes like chalk" ... "I can't stomach this crap" .... "Tastes like cardboard" "Yup .. it's healthy. It tastes like crap"
I know these quotes .. because I was once the person that said them. Let me clarify I'm not talking about fruit bars, energy bars, granola bars, etc., because I personally thing those are an absolute total WASTE. They are full of empty calories, sugar, carbs and crap. I'm talking about protein bars and there are plenty that deserve the descriptions above! However when you find the RIGHT ones, you will never say that again. In fact, you will be like me and CRAVE them! But be careful because many protein bars are no better than grabbing a Snickers with some added protein. You have to really read the labels and ingredients! I've tried tons and there are ton that are still on my list to try. So these won't be my only two recommendations... just my current ones! My choice also really depend on time of day ... if they are pre or post work out, etc. But I am always looking for something not crazy fattening, lower in calories, low sugar is a big one and not too many carbs .. unless they come from fiber. My favorites are by no means probably "the best" ones on the market. But I won't eat them if they at least don't taste good. So here are my faves. Pure Protein (peanut marshmallow eclipse, S mores and sometimes peanut butter chocolate). I don't eat these often. But they are delish! Next up and probably the bar I eat most .. because they are THAT good, cheap when on sale and overall pretty darn macro friendly - Think Thin (Creamy Peanut Butter and Brownie Crunch). These are my favorite! They have a few more calories and fat than Pure Protein but are a larger bar than the Pure Protein bars and when looking at ingredients much better for you. So these are the ones I usually eat. I often have one for breakfast, before workouts, when traveling, or when I'm on the go and can't get a meal in. Both of these are often at Kroger for $1.00 (Ten for Ten .. but remember you don't really have to buy ten to get that price). Now onto the worlds most talked about bars!! I'm talking about Quest Bars. Let me take you back to the first time I tried one. I was SO excited. They are the best bars when you look at marcros. Then I tried one. I was a tad let down. They were not bad by any meals .. but they just were not something that I would be excited about eating - like I am the two I mentioned above. That is until I but those babies in the oven! Yup .. the oven. You don't do anything (except I cut them up in slices). Just 350 ... and bake for 8-10 min or Broil for 3-6min! Literally it tastes like a COOKIE! The favorites by a long shot are Chocolate Chip Cookie Dough, Cookies and Cream & Double Chocolate Chunk. White Chocolate Raspberry is pretty good if you prefer a fruity flavor over chocolate and I'm also trying the Brownie one this week! i will let you know how it is .. I imagine as yummy as it sounds! I eat these as my bedtime snack! I've also heard people microwave them. I did try that once and it was better than eating out of the wrapper .. but nothing beats them baked in the oven. Now that I've developed a taste for them .. eating them out of the wrapper has grown on me and they are 100% my favorite bar out there. You are gonna have to trust me on this one because they are one of the most expensive bars I've ever purchased. $2.50 - $3.00 depending on where you buy them. Sometimes GNC has buy 3 get one free and also box deals online. Also places like Amazon, Vitacost and other online sites have boxes for cheaper as well. So you may want to start with one and see. Please comment with your favorite HEALTHY bar and why you love it! Oh and I forgot to say that all three that I recommend in this blog are GLUTEN FREE! Pure Protein has some flavors that are not but the ones I listed are GF!